The complexity and high level of integration inherent in SAP environments can make development especially challenging and increase the time required to bring solutions to market. Persistent development and test challenges include unavailable systems, inability to accurately model performance and complex test data requirements. 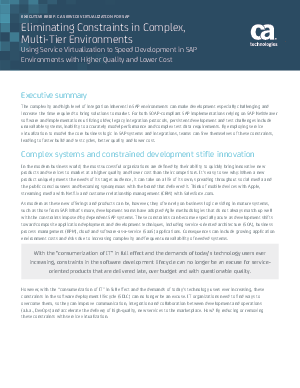 By employing service virtualization to model the core business logic in SAP systems and integrations, teams can free themselves of these constraints, leading to faster build and test cycles, better quality and lower cost.